Consider a Moss Garden ! The Japanese have grown moss gardens for centuries, and some believe that a moss garden will give them a calm and relaxing state of mind. 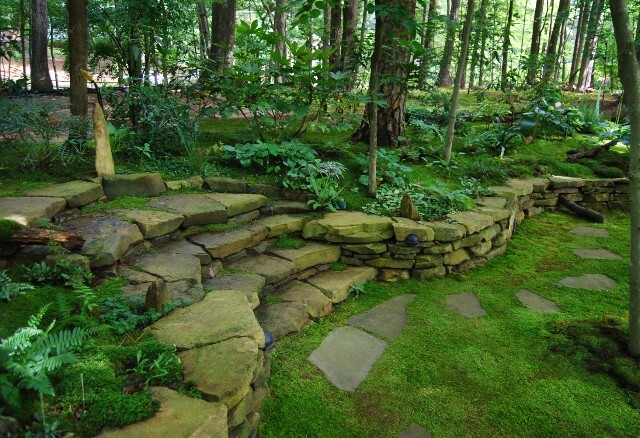 Many options or varieties of moss are available to place in a moss garden. Individuals can choose any type of moss to add a delightful covering to a garden area. Moss is heartier than ornamental grass or flowers. Moss will survive on water and low sunlight. This is good for areas that live in areas that have substantial rainfalls. However, areas with little rainfall and large amounts of sunlight might not be as good of an area for moss. Requires less maintenance than other garden items. Moss does not affect pollen allergy sufferers. By allowing moss to grow and not using chemicals or fertilizers to eradicate it, individuals are allowing the freshwater fish to live. When someone uses the chemical fertilizers to promote flower growth or chemicals to eradicate the moss, the runoff water can flow into the drains and rivers to kill or contaminate the fish. Some types of moss can withstand long dry periods. These types will recover very quickly once moisture returns. However, most mosses require plenty of moisture and very little sunlight to thrive. A location that is appropriate for moss will require very little work to keep it growing. During dry spells, it may require some misting of water to keep moisture in the moss. Moss will work great in gardens that are in shaded areas. Good areas for moss gardens to grow are on the shady sides of trees. If the moss garden is going to be exposed to heavy sunlight, use moss that grows better in the less shaded area such as Bryum or Grimmia mosses. The Bryum moss can be seen on walls or cracks in the sidewalk. The soil will need to be prepared by ridding the soil of unwanted grasses. Moss will kill the grass, but it can help the moss to have a good start by removing the grass before transplanting the moss to the area. Moss can be transplanted from other areas of the yard by cutting a large mat of moss and moving it to another location. To transplant the moss, moisten the soil and the moss mat before placing it in the new location. Plant it at the same level as the ground surrounding it. Pack the soil around and beneath the moss mat tightly. If the yard has no moss growing that can be transplanted, someone can find a garden store that will have a variety of mosses to choose from for a moss garden. Another choice is to find a friend or neighbor who would allow you to transplant some to your garden from theirs. Instead of a moss mat, moss can be pulled up from a crack in the payment, and then place the moss in a blender with some natural diluted buttermilk to make a liquid to spread over the soil bed. In a few weeks, the moss should start growing. Some flowers and grasses require constant care to preserve their health and growth. Moss is an easier alternative for a garden. It is simpler to care for and to preserve its health. More info on Moss Gardens can be found here.